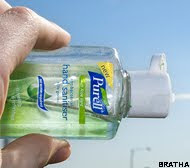 Recent news reports raise concerns that a chemical contained in hand sanitizers, triclosan, may not be as safe as previously assumed. The chemical is practically ubiquitous in consumer products, and if the Washington Post article is to be believed, triclosan is found in the urine of 75% of the population. Wikipedia suggests, coming from another angle, that safe or not, the chemical might not really do anything significant to benefit the consumer, except in toothpaste, where it apparently does help combat gingivitis. I want to suggest another thought. Not only does the widespread dissemination of synthetic chemicals into the natural environment defy the precautionary principle, and put the environment continually at risk, since we don't really know, ahead of time, what these chemicals do, "sanitizing" ourselves against nature, which is really what sanitizing agents attempt to accomplish, is actually based on the idea that we are somehow "separate" from nature. That idea is erroneous. We do not need to insulate ourselves against the presumed adverse impact of other living things, to the extent that we need to kill off all these lesser organisms, which we usually call "germs." In fact, the interplay of all the organisms that populate the world, including the "germs" we worry about, is what has made life possible for us. Using "sanitizers" to kill them off builds up bacterial resistance, which is an ever growing problem, and one that news reports are beginning to discuss. I am in favor of washing my hands on a relatively frequent basis, and I hope others do the same. I do not think, however, that we need to deploy chemical agents in the form of "hand sanitizers," to undertake a wholesale extermination of the microorganisms we can't see, and ruthlessly to separate ourselves from the world they inhabit. In fact, we inhabit that world, too!